ADULTS: $99.00 $69.00 KIDS (4-11): $49.00 $44.00 - YOU SAVE 30% ! Just 40 minutes south of Cancun, in the heart of the Riviera Maya, lies Selvatica, an ecological park covering more than 250 acres. In this park, halfway between Cancun and Playa del Carmen, lies the Selvatica Canopy Tour, a series of 10 exciting zip lines, stretching over 2 miles and 18 platforms - the biggest, fastest, longest and most famous canopy tour in Cancun. In the tradition of the famed Canopy Tour of Puerto Vallarta, you'll strap into a secure harness and zip through more than 20 Acres of Mayan jungle, a truly amazing experience full of laughs, fun, and pure adrenaline that is great fun for everyone age 4 to adult. Cancun's #1 adventure tour is a don't miss! You are guided through the treetops by your funny and helpful guides, who ensure your safety as well as your enjoyment throughout the tour. 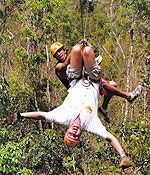 Fly on the famed "Extremo" circuit of 10 fast and exciting zip lines from tree to tree, while your personal photographer takes pictures and video of your thrilling experience (available for purchase after your tour). 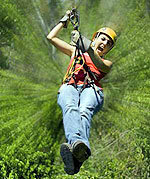 Perform acrobatic stunts while zipping (if you like) such as flying like Superman or even zipping upside down! What a rush! It is sure to leave you grinning from ear to ear. After you've finished the canopy tour, ride in an army truck to a hidden jungle cenote, where you can cool off with a refreshing swim, even ride a zip line into the clear blue waters! This is one of the most popular and in-demand tours in Cancun, so make sure to book early! Tour Schedule: Monday through Saturday at 9:00AM, 10:30AM, 12:00PM and 1:30PM. Exact pickup time will be stated on your reservation confirmation voucher. Kids: Ages 4 and Up. Kids prices apply to ages 4-11 years. Kids must be 8 years old to zip line by themselves instead of tethered to a guide. Photos and Videos of your tour are available for purchase on-site. Bring: Swimsuit, Biodegradable Sunblock, Insect Repellent, comfortable shoes, extra t-shirt, towel and extra money for souvenirs or drinks at the bar.